Madikeri: With no respite from incessant rains, the Kodagu district administration has declared high alert across the district to monitor rain havoc and floods. Even as rain continued to lash the district, the district administration has declared a holiday for schools and colleges today and will take a call on declaring a holiday tomorrow also depending upon the situation this evening. Almost all water-bodies are full to the brim and some are even overflowing, causing concern for the residents. Also, vast tracts of land are inundated with rain water. Meanwhile, the outflow from Harangi Dam was recorded at 35,000 cusecs this morning, an increase of over 10,000 cusecs from yesterday, it is learnt. 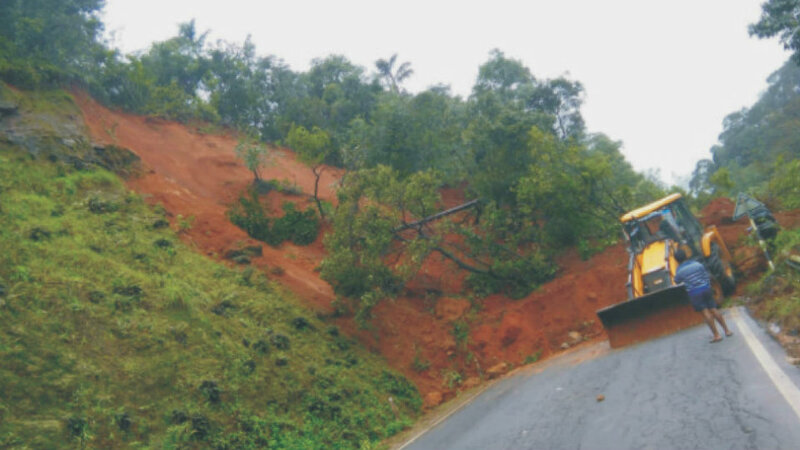 Madikeri-Mangaluru road shut for vehicular movement: Even as the district administration is struggling to cope with pounding rains, a heavy landslide near Madenadu this morning, has forced the authorities to shut Madikeri-Mangaluru (NH-275) road for vehicular movement. The road may be closed for several hours as it takes some time to clear the landslide and make way for traffic movement. With the road blocked for vehicular movement, vehicles on the busy highway piled up on either side of the road, forcing the motorists to pray for early clearance of the road to continue with their journey.